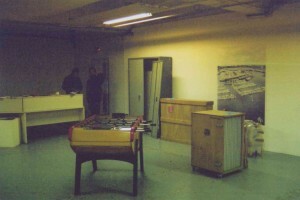 Housed in a 4000-square-metre warehouse for the past 25 years, Passerelle contemporary centre d’art spreads through various spaces… Art critic Joëlle Le Saux and artist et Benoît-Marie Moriceau, long-time friends of the centre, offer a plunge between fiction and reality, summoning memories, archives and stories. The text is a sensitive and subjective to-and-fro between the history of architecture and exhibitions, informed by the accounts of people who have visited Passerelle. It is conceived as both a guided tour and an inner journey that sketches possible circulations through this fascinating building. The Patio is the name that was given to the area where you are right now. The large courtyard is the heart of the building and this is where the tour begins. From here you can access all of the rooms, including the basement and the first floor. If you look up, you will see the concrete ceiling with its glass roof top giving the place a clear and diffused light. The upper walkway defines the perimeter of the Patio. It is visitors’ major point of interest. From there, you can actually enjoy the breathtaking views of the space below, but also the beautiful skeleton of the structure. When you climb up there, you can easily see the wood shapes on the concrete’s surface. All spaces haven’t been remodeled at the same time. Along the years, floors and walls have been repainted, extra walls have been created in various spots, door and window frames have been changed and a ventilation and heating system has been installed. But the place has not changed much, if not by the absence of many things he was filled once. The large porch you used to enter offers direct access to the dock (in French “le Quai”) from the outside. Before, trucks borrowed this corridor which may suggest a sort of alley, and came to drop off their goods directly to the Patio’s Quai. For a long time, the place remained mostly related to trading. It was built in 1946 to meet this purpose. First, grocery store business and then fruit and vegetable’s storage, it was finally converted into a furniture store before being abandoned for several years. The proportions of the rooms are different from each other. Even more intimate areas are considered as such only in comparison with the vastness of the Patio. Passerelle is often described as French largest art center, a legend well maintained that nobody has ever really tried to verify. If you now look to the entrance lobby, you will see a door on the left. You can go there: it is open. It was before the reception area and library. The building entrance was through this piece before it was painted black in order to project movies. It is difficult to see things in the dark, but you have to imagine the room with a large window opening, office furniture and displays. I remember the first time I came here. There was a football table. I played it without knowing what I was getting at that very moment, the character of a long time written partition. What I remember most is that the game was interrupted by the sudden arrival of other visitors who magically came from the metal cabinet facing the door. I was told that whoever had designed this way, dreamed to stop the time and tried by all means to evade and disappear while the others were waiting for him. No doubt, the combination of all these moments imposed on my mind the memory of that day. It was perhaps not the first time that I was here, but that’s what I remember. You can imagine that a lot of things happened in this place. But we do not keep all the same memories. Perhaps this is actually the first time you come here. What is certain is that things change, and when they left, the memories we had in turn may faint. People forget. But the problem is that they do not necessarily forget the same things. And if you wait too long to rethink it, no effort, no matter how intense, will succeed in tearing into oblivion. We forge our own stories that we shape and reshape constantly but for a place like this, nothing is irretrievably lost. Thousands of things, sometimes insignificant can help us to remember as they allow those who do not have memories to create their own. On the other side of the projection screen, archives are stored. On the back shelf, carton boxes and books are stacked, including a catalog which is marked: The Beginning of the Misunderstanding. It contains a photograph showing a man in a yellow raincoat cleaning the exterior facade of the building. The print is dated April 1992. The image was taken from Charles Berthelot street. It also shows a scaffolding installed at the entrance and a 1972 truck. 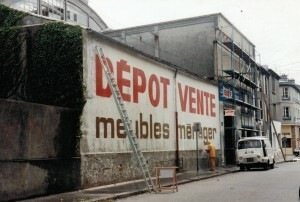 Over the entire surface of the main wall, an advertising is painted in large red and brown font on a white background. 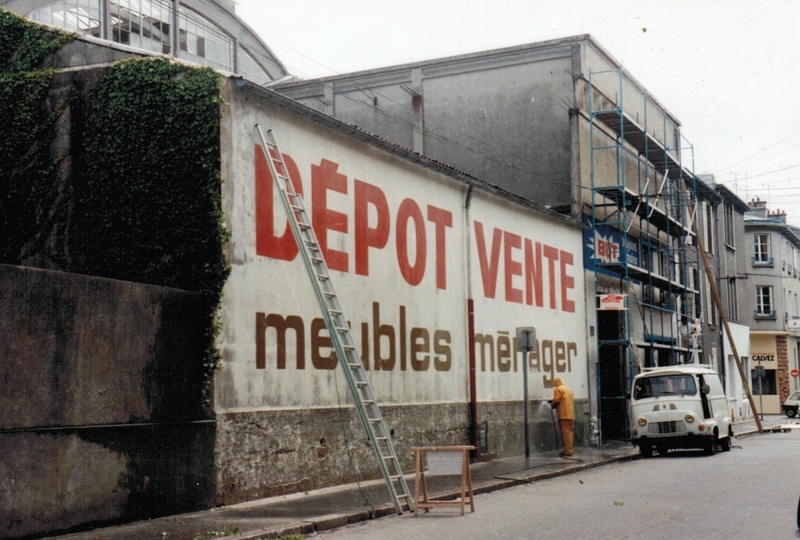 You can read DEPOT VENTE – (meubles ménager). It was at this time that too obvious traces of previous activity have been erased. A few years later, the inhabitants of Charles Berthelot street could discover new words from their windows. Now, the fonts are so numerous and so small that they no longer have any commercial ambition. Not only you need to get close to able to read them, but it is also necessary to take his time, like reading a book. The author of the text was given the challenge to condense hundred years of history in a single year. Beyond the wall, the imposing structure of the roof extend across to the Massillon street. At number 17, on the way to Siam, stands the house where Victor Segalen was born. A sign shows the exact location of the house, built before the destruction and reconstruction of the city. Among all Brest-born writers, he was one of the greatest travelers. He took advantage of the stops to give free rein to his passion for archeology and ancient stones which he devoted a number of works. The thousands of Bretagne typical standing, carved or aligned stones, are perhaps not unrelated to its passion that pushed him to study Chinese steles during his travels. As a child, he perhaps had the opportunity to go further north, on seaside, visit Beg-Monom site. A few years ago, someone wanted to bring a huge stone from this place, to place it here in the middle of the Patio. On site, there is now a heap of rocks barely recognizable from what was once a home to the Iron Age. At the cape, there is still that very stone from the top of you can scan the entire coast from the Batz to Virgin Islands. 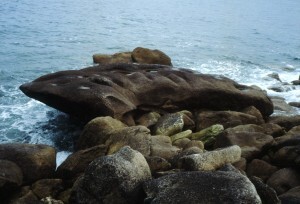 The stone is so worn by the sea that its looks hand-carved. By far one could believe a dead whale or a kind of gigantic sépion. To bring it here, a convoy able to support its weight and make it across the city would have been necessary to invent. Such a project seemed far more unthinkable than moving Egyptian obelisks around the world, as we have yet practiced for centuries. Finally, this unlikely connection between the old site and the modern town never took place. We’re back in the Patio. If you take the right steps to get on the Quai, you will see the ground on the left of the stairs, thirty holes in the ground. These holes were made on a regular basis but they follow the path of a curve, or more specifically, a sinusoid. But this figure does not match any pattern of the building that keeps a straight and orthogonal appearance, unadorned and without curves, with the exception of the curved roof and spiral staircase. It is difficult to guess the origin of these holes that seem to respond to any logic other than the form itself. A few steps away, it is possible to observe other traces at least as strange as those we have just seen. At the back of the Quai, you’ll bypass the central wall and into a sort of back room left in the rough. The walls haven’t been restored and some parts of masonry were obviously demolished. The tiles on the walls suggest, from what we could infer that this area contained tanks for the storage of wine. If you now approach the tiles, you will see that, contrary to appearances, they are not made of black ceramic but glass. Applied to wet cement, glass should logically by transparency, take a gray color but we do not know by what strange phenomenon, what unexplained chemical reaction, the glass reveals a dark color. The phenomenon has grown over time, imperceptibly. But the strange thing is that, when taking off the tiles, glass instantly regains its transparency and cement its original color. As if black had vanished at once. For a long time, we wondered how the Greeks were able to achieve these famous black vases with red figures without using paint or pigment. The decor of terracotta was obtained by the combined effect of a water saturated with clay and a complex mode of cooking, making successively appear red, black, then black and red. Thus, claims that one of the milestones to get the black color, outside as well as inside the vases, was to throw at a specific time, a bundle of vines in the oven. Could it be that the tannin also present in the wine vats becomes the cause of darkening glass tile? Or maybe is it the result of residual fumes produced by bananas ripening that were once stored in rooms in the basement, just below the tanks. The ripening rooms still exist but the place is not accessible to the public. A black and white photograph hanged above the sink in the public bathroom however gives you an idea of the atmosphere in the basement. Long are packed tightly a bunch of disparate objects, bric-a-brac of materials, wood, metal, drywall, paint cans, boxes, ornaments and furniture. A sofa is stored in a corner, probably left there since the store closed. Maybe it happened after, maybe noone could never get it out, and it stayed there. Still, one can not help wondering by what miracle it has been able to get there once, because none of the two doors to access to the basement is large enough. We will stay for little more on the level floor. Still on the Quai to the left of old tanks, is a double door that gives access to the seminar room. It may be closed. in that case you can take the lane at the left end of the space to get there. It is located behind the stairs. There is little to see, except for rows of empty chairs and long white curtains hung along the walls. The painting had previously been used to project images of the arctic continent and everything seems to also remember the cold that prevailed here in the winter. Even Monstera deliciosa plants which acclimatize beautifully in the light of glass blocks, take on an icy shade and artificial reflections. Around the central pillar, a hamster’s farm has once been settled. Rodents enjoyed a space equivalent (reporting to man scale) to one and a half acres of land on which one had placed a miniature house. Despite the comfortable dimensions of their land, they mostly remained in private, huddled in their little shelter. In sawdust spread on the floor, a tangle of concentric circles of wood with multiple levels stood as a playground beyond the limits of their enclosure. No doubt that if they understood that they could climb or if only they could see, they would have earn their freedom. Let’s get out of the seminar room and take the adjacent staircase. I should have said from the start that all kinds of architecture and landscapes have been gathered here. Much like a system of nesting dolls, as if the place dictated himself this repetition and implicitly aroused the desire to generate new spaces. On the second floor, for instance, you can get in a small room where an ancient city ruined landscape was shown. Fragments of charred wood submerged in the dark waters allowed vaguely to imagine what the city of Ausee looked like before its destruction by fire. The two authors of the model had invented this fiction at the end of last century. Before embarking on the reconstruction of the city, they had examined all documents and texts on the architecture of ancient cities. However this model was produced as closely as possible, it reflects all the uncertainties, fuzzy and interpretations that we are sometimes forced to do in the past. The ancient writers have left us many descriptions of the architecture of cities and palaces around them. Yet some have based their stories on older stories, simply because what they wanted to talk about was already long gone. When the inventory of the past mingles with the beauty of the ruins, there is inevitably a form of nostalgia. This is what allows us to find the beautiful decay and accidental coincidence of a landscape. Thus in the small room which is just next door, broccoli, carrots and lentils had been stored for a few weeks. The humidity was so intense that the walls had begun to rot, producing very odd shapes. Before going to the mezzanine, where you can finally enjoy the view, you will enter a huge room whose structure is built on the same model as the Patio. Under this large concrete vault, we must also mention the most beautiful works that we have seen here. They were clinging to the back of the room, paintings for the most different formats, some sculptures as well. The story began with a simple description of a painting by Paolo Uccello, Night hunting by the historian John Willett. 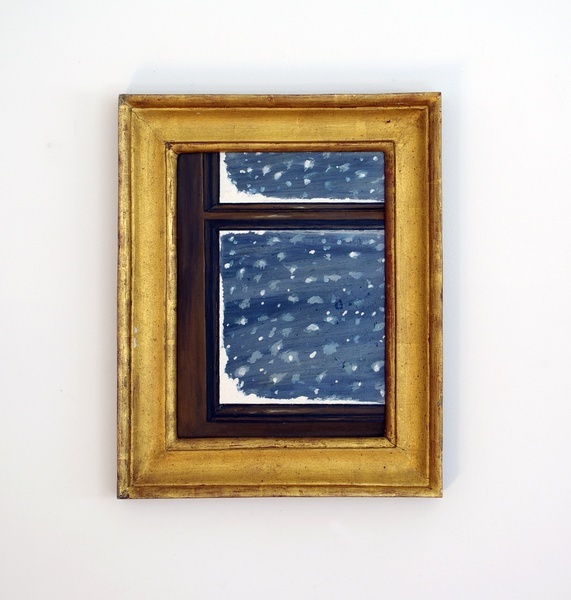 He tried to express with as many details as possible the precise memory he kept this work. From this description, the painter had reproduced the work. Then he started the experiment again by asking other friends to describe a work which had particularly affected they and they found beautiful. The copies were not so true to life, at least they were fairly consistent with the memories he had collected. Among those he had requested, a friend had mentioned a work he actually had never seen but was described to him by somebody else. 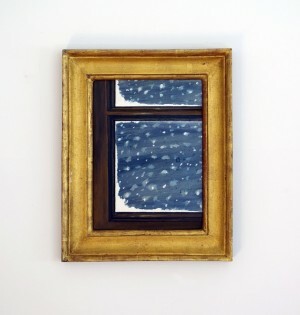 It was an interior scene with snow that accumulates on the window crossbars. What he learned from this description, this was how the painting was represented flake after flake, in broad strokes of white paint. The work is in Italy. It is not known if the painter and his friend felt like one day to go check what the painting really looks like and if the picture that one and the other were picturing was not too far from the original. Most of the time when you decide to go to a place where no one has gone before, it already has in mind a series of real or imagined pictures. You can verify their accuracy, but you inevitably end up discovering something you did not expect. Thank you to Hugo Chereul and Franck Robert and all those who shared their memories with us. The invitation to rearrange the contents of this web-based collection, reminds me of the passing down of a great Naga necklace. As if each slideshow, web-performance, video, text, or audio work, were loosened from a cotton thread, and laid out on a taut cloth, like carved white conch shells, brass bells, red carnelian, bone, and blue-green glass beads, waiting to be newly strung. As I read and listened through the contents, I began to dream of jewelry setters. And so here I tell, if you wish, a decentralizing story; not decentralized, but one whose claim has the capacity to make the centre, come to seem estranged. After crossing an arc, at the eastern edge of India, is a hill region bordering Bangladesh, China, Southern Tibet, and Myanmar. Among the states of this area, is exquisite and troubled Nagaland, with its innumerable cultures, united under the word ‘Naga’ and yet with communities, each with differing and exceedingly democratic models of government, and different material culture. Its worldviews that have the potential to open new ways of thinking about art are preserved in fragments of remaining material culture after the onslaught of proselytism and modernization. Among them is the philosophical linking of ornament with society and individual ethics. In ancient times, and still practiced by the conceptual works of the artist Veswuzo Phesao, is the right to decorate one’s bodies, clothing, or one’s home, based on a system of being able to calibrate individual merit as value: which was always somehow, value earned within a community, through codified rituals of generosity. Status came from having always individually earned it. A warrior, or one who fed his surplus crops to the village, these were the terms under which one was given permission to decorate one’s home. After passing on, one’s children could not inherit the ornamentation; they again would have to individually earn the right from society. Over 2007 and 2008, I spent time in this region, writing about its contemporary art, and have been going back ever since. Hekali Zhimomi, the then director of a government-run art centre, the North East Zone Cultural Centre, told me of her own research into jewelry and value. In Ao Naga culture, she explained that when a work of jewelry is passed down, or purchased, before buying it, the new wearer must hear all the stories and merits of its first maker and past owners. It is through their personality and deeds that the work of jewelry could accumulate value. The work of jewelry has ethical provenance. And the character of its past wearers, is a strong determiner of its value, translatable into a shop price, but in reality a contemporary oral tradition of storytelling in continuance – where a graduate degree may be a new determiner of social achievement. For the Naga communities, jewelry – like all aesthetic and ritual – has been over time coded, eroded and re-coded. 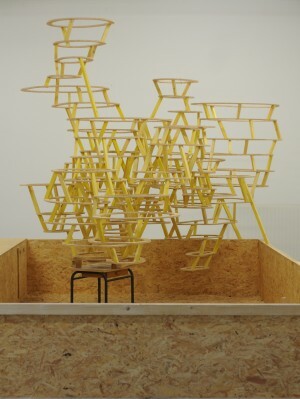 It is a lens and a trope through which to perhaps read the particular form of value, in the efforts of such a website – to hold together the fifty centres d’art contemporain across France in one light website: whose entries are arranged by center, by author, or by the materiality of response. The series, and resetting of the series, gives the impression that there are also infinite subjective arrangements possible. The invitation to four editors from far-flung parts of the world, to restructure the contents of the website, with a new editorial over the course of four seasons, implies a seriality ricocheting within the content, like a musician within the set notes of a raag. Presented by the Centre d’art contemporain de Brétigny, Matthieu Saladin writes a text to accompany an exceptional sound score made in 1968, ‘LIKE A CLOUD HANGING IN THE SKY?’ by the group AMM. The group in turn had made this work in response to a prose work, ‘Sextet: The Tiger’s Mind’, by one of its members, Cornelius Cardew. What is key to my own arrangement, is the way Saladin’s text approaches artistic inheritance. In Saladin’s own writerly and artistic engagement with a double inheritance of the two works, he emphasises how ‘Like a Cloud’ was not a performance of ‘The Tiger’s Mind’, but an engagement with it, through new experimentation. Emmanuelle Pagano’s ‘NIGHT-LIGHT’, at Espace de l’art concret is a writing experiment. It is a novelist’s selection of works from the Albers-Honegger Collection that performs a similar function in re-stringing works, by new criteria. These objects handed down to us – works of glass, a globe of light – are given emotional life, through the biographic form of storytelling, by which he links the defiance of gravity by an astronaut, with that of the glass blower. Aymeric Ebrard, uses an alacrity of visual and aural description, in an autobiographical narrative, to capture being split: in this case, between two different residencies, in Lithuania and Morocco, intercut with each other in close succession. The text is a double view, titled with the cinematic ‘The Kuletchov effect’, suggesting something else arises from the combined meaning of two vivid and dissimilar images. What it captures, is for me, a form of writing in whose own poetry is wrapped a deeply clear, political voice. Take this sentence on Saïdia, at the Moroccan-Algerian border: “On either side, the run-down buildings would prance their social housing pealing volumes next to the camp pavilions owned by the Minister of Youth Affairs and Sports.” Ebrard writes within ‘MODELS OF PRODUCTION’, at Centre d’art bastille. I am reminded, in my own insistence in listening for the first person, poetic voices, of Helene Cixous’ writing, and many others – that taut, crystal, political gleaning that accompanies each double-entendre. In a series of letters, Guillaume Pinard and David Evrard discuss themselves, their own personalities, in ‘NOBODY CAN ESCAPE ART’ for Maison des Arts Georges Pompidou. From their lively writing, we hear a self-reflexive discussion of value and consumerism, gift-exchange, and collecting. The director of La Galerie – Centre d’art contemporain de Noisy-le-Sec, Emilie Renard, corresponds with the art critic Sinziana Ravini in ‘DEAR SINZIANA V. DEAR EMILIE’. From this perspective, is also Aurélien Mole’s use of a futuristic, exaggerated, biographical voice in ‘HIATUS’ written for Parc Saint Léger. 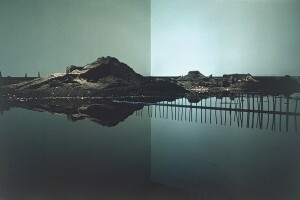 “Even if I think that art is all about context (does not exist outside a certain place, a certain time, a certain onlooker) and all about audience (it is in relation to the audience the artist determines what has to be done), I think art is also all about the intention of an individual, the artist” writes Dora Garcia in “I UNDERSTAND MY ACTIVITY AS A RESEARCH” for 3 bis F – centre d’art contemporain. She gives the example of “The Beggars Opera” 2007, which she defined as “theater play in real time and public space”- for Münster Sculpture Projects. The most art historical of all the texts, is possibly, that of Gilles Drouault, who recalls brilliantly in the video, ‘THE WITNESSES’ at Centre d’art contemporain d’Ivry – le Crédac, an exhibition of particular value to him, and he explains generously why. To him, this exhibition on industrialisation in the last century; was pertinent to its location in an once billowing industrial town of Ivry. Intrigued at how film and industry developed at the same time; he conjectures, that what has been most compelling about the 20th century, has been the development of the industrial world and the worker; premising that what was siginificant to the 20th century in particular was the worker as an individual with rights, worker’s strikes, as capable of forming trade unions. One of the achievements of the Western European system has indeed been the welfare of workers. The political subject matter in Alexandre and Florentine Lamarche-Ovize in ‘LAMARCHE-OVIZE, A COLLABORATION PROJECT’ for Micro-Onde, centre d’art de l’Onde, show a work dealing with women’s prisons. Antoine Marchand in ‘LET’S MEET IN TROYES, AUBE’ at Centre d’art contemporain / Passages, discusses being invited to devise ways to dispose of nuclear waste, and the ability of an artist to respond, or give value, to such a residency. Fabien Faure in ‘THE TIME OF SITE’ at CAIRN, centre d’art, writes of mining and its relationship to land art. Yet, there is also political strategy latent in the writings, for example, of Olivier BossCentre rhénan d’art contemporain, has a moment, where so as not to be surveilled, by the number of webcameras one takes in the subway, is suddenly a face, painted like the dazzle-pattern used in submarines during the First World War. It gives a moment to delve underwater and dip into art history, as something actively working as strategies in a politicized world – if one thinks of cinema, then terrifyingly and increasingly used today. In another discussion of cinematic effect, ‘EMPOWERMENT’, at Jeu de Paume, Antoine Thirion a critic, responds to an artist Claudio Zulian, who has been using cinema as a political tool, using historical re-enactments, and repetition as a strategy. I end this arrangement, with a performance: Emma Dusong makes the web-performnace ‘DOOR’ for Centre régional d’art contemporain Languedoc-Roussillon.